WBs, or Welcome Backs, are pretty much what they mean. They "Welcome Back" somebody when they join a channel that you are in, usually the person's name, in between two "WBs", and a message attached to the end. This message is set by the WBer, usually something the person being WBed said. Sometimes the WBer just puts anything at the end, with the WB being his/her main intention. To add a WB for a person, open up the SysReset menu. Select Greeting Manager to open up the WB manager. Once you are in the menu, enter the person you are WBing in "Nickname:". 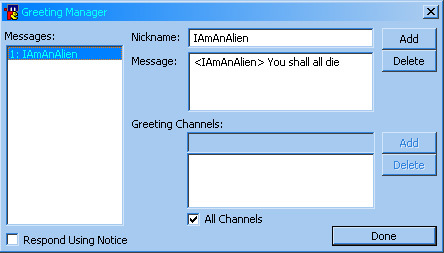 Then add the message you want to welcome them with inside "Message:". When you are all done, click Add. This person's WB can be modified any time, just come back to this menu, and change the nickname or message and click "Done". You may set all WBs to respond in all the channels you are in, by checking "All Channels", or you may set only the channels you want to use by unchecking it. Add the channels by putting their name on the text box next to "Add", and click the button. You may WB them by Notice, but pretty much everyone does not use that, because they want everyone in the channel to see the WB.